If you had mentioned the word kneepads and snowboarding together a few years ago I would have probably laughed at you and rolled my eyes. That was before I moved to Crested Butte, CO home of the first ski resort in the U.S to allow an extreme ski competition to take place on their slopes. My first big powder day at the resort I linked up with local pro-Gareth Van Dyk and was very surprised to here he was wearing Black Diamond TeleKneesis Kneepads under his snowboard pants. I had never even considered kneepads, let alone Black Diamond ones but after hearing stories or rocks and stumps that were hiding under the snow I drove down the mountain and purchased a set from the local ski shop. The extra confidence that comes from riding with the Black Diamond TeleKneesis Kneepads helps when riding in exposed or rocky terrain. One of my favorite features on the knee pads is for when you are resting on snow, you can lean on your knees without worrying about poking rocks. The last time I was on the mountain I managed to clip a buried stump with the side of my knee, luckily I had these kneepads on and just chuckled thinking about how much these have already saved my knees. Earlier in the year I forgot to wear my kneepads, went out on the hill hit a mogul with my knee and was out of commission for 7 days. 240 g, 8.5 oz per kneepad. 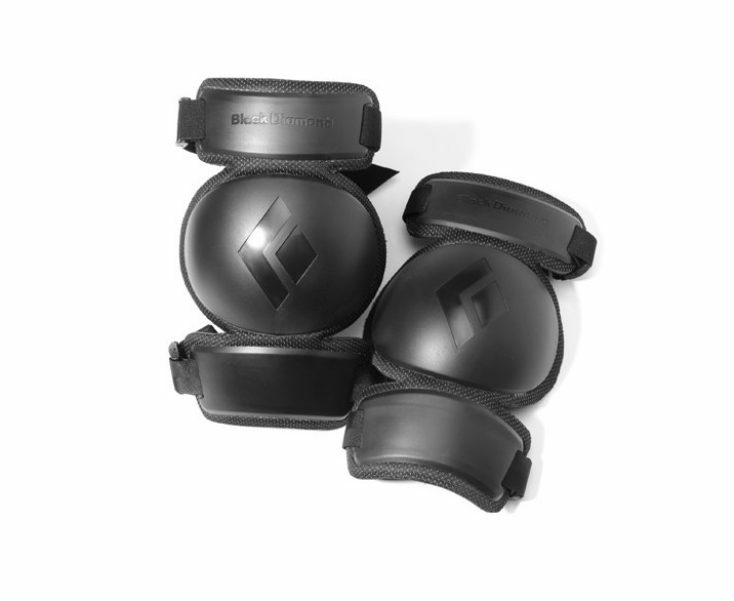 The Black Diamond TeleKneesis Kneepads weigh much less then kneepads that are used for skateboarding and motocross. It is easy to forget the pads are even on your knees. I have had numerous day where I get off the hill and immediately start working on the daily Powder Journal while still in my ski gear, this includes the pads. 2 straps on the kneepad allow you to adjust the size to fit everyone from Shaq to a teenager and in between. One size fits all anatomic and performance fit. I actually really enjoy the way these feel while riding and walking around town. It even adds warmth to my knees. The Black Diamond TeleKneesis kneepads are very comfortable with a soft wicking liner that feels like the inside of a snowboard boot. The pads are low profile enough you can even take them on and off while wearing your pants. This is a huge plus for some people if you’re running late you can grab your pads and go. With full coverage protection during bent knee exposure these pads will help to minimize accidents and keep you out on the hill for the entire season, now that’s style!! My Black Diamond TeleKneesis Kneepads have become an essential part of my snowboarding gear. I will NOT leave the house without these if I am planning on riding. The pads keep my knees warm, protected and give me that extra bit of confidence to really drive my knees into deep turns. The pads say they are for SKIING USE ONLY, however, these might also work for mountain biking or other light-impact sports. I am so happy to have found another wonderful product from Black Diamond. As I look at my backcountry pack 3/4 of my outdoor gear terr is made by Black Diamond!!! Even if you don’t ride at a resort with rocks, these pads a great preventative measure that you can use to keep your knees healthy. I just wish I would have found these when I was riding allot more in the terrain park hitting handrails, jumps and the halfpipe. If you only buy one ski or snowboard item this winter, make it a set of Black Diamond TeleKneesis Kneepads ($59.95) you will be thanking me later I promise! !